Are you an M.C. Escher fan? Titillated by tessellations? Warmed by woodcuts? Join the Associates of the Boston Public Library on Tuesday, May 8th to learn more about M.C. Escher and his works, with Museum of Fine Arts curator, Roni Baer. The Associates recently funded the digitization of 89 Escher prints owned by the Boston Public Library, four of which are currently on display in the MFA’s exhibition, M.C. Escher: Infinite Dimension. In this talk, Ronni Baer, Elfers Senior Curator of European Painting at the MFA, will introduce the exhibition M.C. Escher: Infinite Dimensions, on view at the museum until May 28. 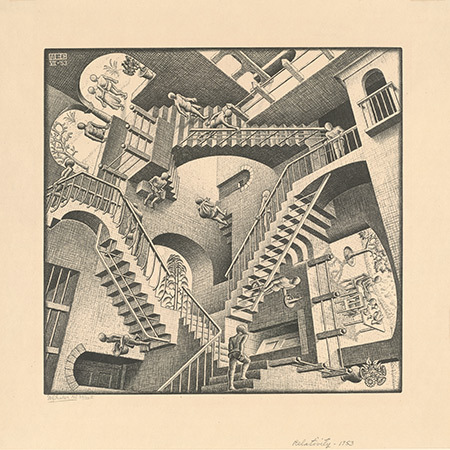 Considering Escher’s choice and mastery of printmaking techniques, she will trace the development of the artist’s work, from his self-portraits, landscapes, and still lifes grounded in Dutch pictorial tradition; through his obsession with tessellations, or interlocking forms; to his experiments with optical illusions and perceptual games. M.C. 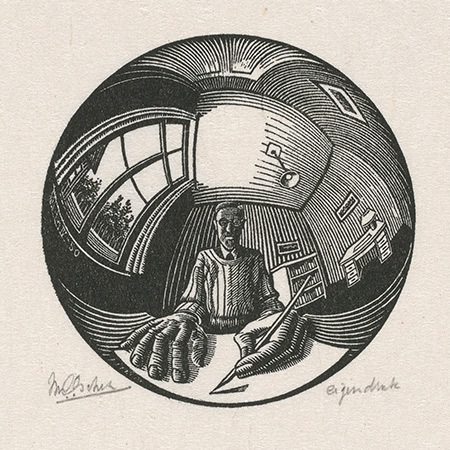 Escher (1898-1972) was a Dutch printmaker whose preferred techniques were woodcut, wood engraving, and linoleum cut. Escher was fascinated with geometry and symmetry, and how those abstract design elements could be incorporated into his representations of the physical world, or world from within his mind. He explored how to represent people, animals, and objects rising from the flat page and then returning, as well as how to represent the endlessness of infinity. As a result, Escher’s work has been recognized both in the art world and in the scientific community. Ronni Baer received her Ph.D. from the Institute of Fine Arts at New York University. Before coming to the MFA in 2000 as senior curator of European painting, she taught art history at the undergraduate and graduate levels and worked in curatorial departments at major museums in New York and Atlanta. She was curator of a monographic exhibition devoted to the paintings of Rembrandt’s first pupil, Gerrit Dou, that was shown at the National Gallery of Art in Washington, the Dulwich Picture Gallery in London, and the Mauritshuis in The Hague. She has published widely in the fields of Dutch, Flemish, and Spanish art and in the history of collecting. In Boston, Ronni has spearheaded numerous acquisitions and gallery installations, including the recent promised gift to the MFA of 113 Dutch and Flemish paintings, and was curator of, among other exhibitions: The Poetry of Everyday Life (2002); Rembrandt's Journey (with Cliff Ackley) (2004); El Greco to Velázquez (2008); and Class Distinctions: Dutch Painting in the Age of Rembrandt and Vermeer (2016). For her work in furthering knowledge and the appreciation of art and culture, Ronni was knighted by King Juan Carlos of Spain in 2008 and by King Willem-Alexander of the Netherlands in 2017. Her most recent project is M.C. Escher: Infinite Dimensions, the subject of tonight’s lecture, currently on view in the Rabb Gallery at the MFA until May 28.